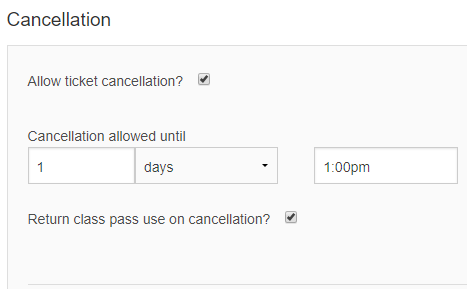 If you select to return the class pass then your customer's use of a class pass will be returned to them if they cancel an event booked on that class. If you leave the box unchecked the class pass slot will be considered used even if they have cancelled the class. It is important to note that cancelling a customer's original class booking will not cancel the class pass itself. You can disable the class pass in your discount options page (click edit then move the toggle to unpublished) but, again, this will not cancel any outstanding uses on the pass, only make it unavailable for purchase. If you need to cancel a class pass get in touch with the Bookwhen team (quoting the booking reference) via the in app chat or email (support@bookwhen.com).